Musings 'n scribblings of a philanthrope .. : Circular (endless) runway airport, design and environmental advantages ..
Circular (endless) runway airport, design and environmental advantages ..
Is this a realisable plan ? Most of the airports around the world, since the days of start of commercial flying around the 1950, are designed lengthwise along the runway. As the runway had to be around 4-5 km long in modern airports this necessitated acquiring land in excess of actual airport requirements on a 4000m long x 500m broad stretch of land. India’s domestic air passenger traffic stood at 100 million in 2016 and was behind only the US (719 million) and China (436 million), Sydney-based aviation think-tank Capa Centre of Aviation said in its latest report. - Livement.com, March 2017. Circular airport design which is being tired in Netherlands is a very interesting idea that needs serious consideration from aviation experts around the world. The debate on circular airports is quite interesting and raises many fears and apprehensions. More than all the fears, the benefits to the environment are mind boggling, leading to less infrastructure costs, accidents and damage to the environment. 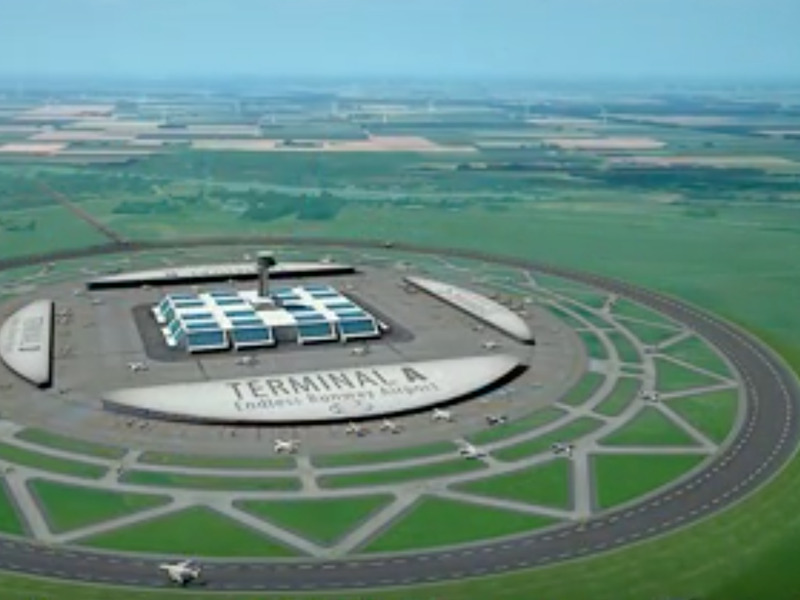 The circular endless runway airport planned in Netherlands by 2050 AD in comparison would be about 2376 acres (3500 m diameter) in area. Since at any time three flights can take off or land from the circular airport (of 3.5 km diameter), considering a minimum of 2 minutes between two successive aircraft movements, the airport can handle almost 90 takeoffs or landing every hour. A. Area covered : An analysis of some of the more popular airports in India and the world :. Airports need lot of open space for the buildings and the runway and that is one area where circular airports can make a huge difference. Green airports could be beneficial for the environment ..
1. Kochi International Airport, the only 100% solar energy powered airport of the world, THE ONLY COMPLETELY GREEN AIRPORT OF THE WORLD, with its own waste treatment, rainwater harvesting and organic vegetable farms, running on a 27 MW solar power plant, is spread over 1213 acres. 2. Mumbai Chatrapati Shivaji International Airport is spread over 1450 acres. 3. Hyderabad RG international airport is spread over 1500 acres. 4. Bengaluru KG international airport is spread over 4000 acres. 5. The world's most busiest, HJ Atlanta international airport, US is spread over 4700 acres. 6. New Delhi IG international airport is spread over 5106 acres. 7. New York's JFK International airport is spread over 5200 acres. 8. World's largest, Saudi Arabia's King Fahd International airport in Dammam is spread over 1,92,660 acres .. ie. 48x Bengaluru and 384x Kochi !! This airport is larger than the country of Bahrain and 10% bigger than the city of Bengaluru. 1. Runway length : While most of the great airports have their longest runways about 4-5 km in length, the circular airports have minimum 11 km long (pi*diameter of 3.5 km) real runway and virtually an endless one (as one does not come across the problem of coming to the end of runway and having to rise again or facing and accident). 2. Airport area : A 3.5 km diameter airport will take just 40% area of a conventional airport, helping save the environment in a big way. 5. Subway approach : approach roads could be built from different sides enabling quicker access to airport and departure from the airport for passengers. Given that the air travel industry is growing year on year at a rate of 8-10 %, the concept of one large airport meeting the demands of the population of a major city is impossible and like in the West, we need to build more and more medium size airports. Airports of the future could be using these designs to save land, costs, fuel and time for passengers and efficient utilization of resources by adopting such compact and convenient designs ..